Today Fetter and I worked on a couple of Ficus microcarpa and a Podocarpus gracilior. Let’s start with the Ficus trees. 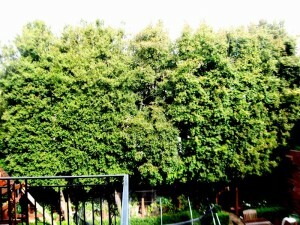 The goal was to do light, natural flow pruning. 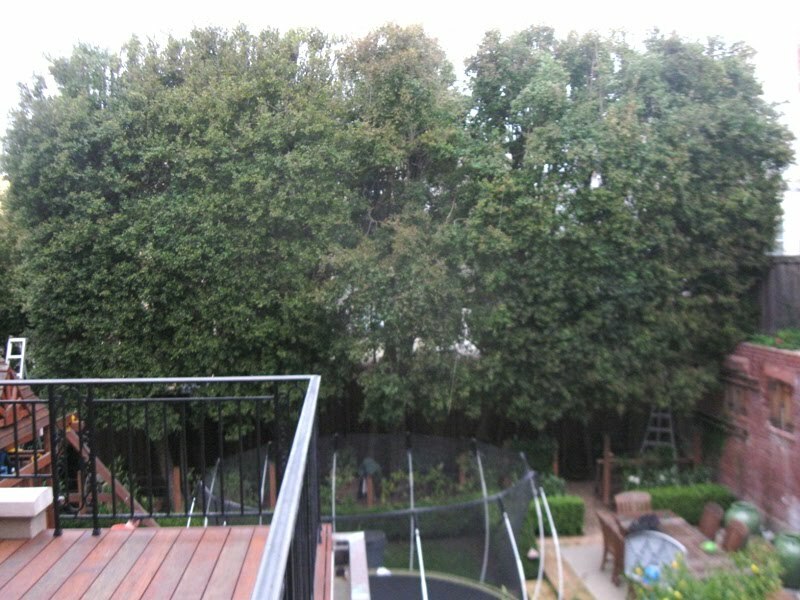 We want these trees to grow big, but look natural. As you can see it doesn’t look like we did much at all. 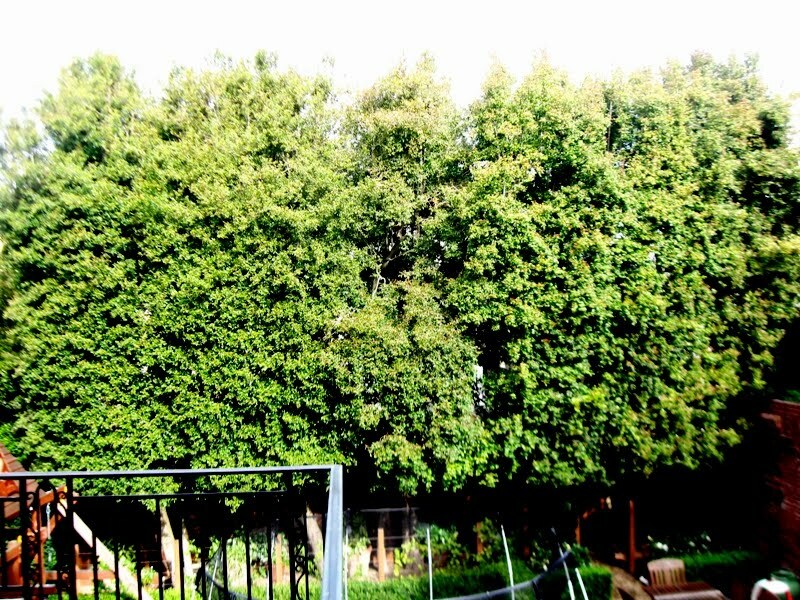 I like it when you look at one of my trees and you wouldn’t know that it had just been pruned. These are fairly young Ficus street trees. It’s my guess that they have been in the ground for no more than 5 years. 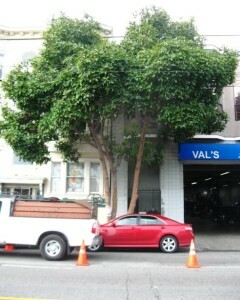 You don’t see many young Ficus trees here in SF. Back in the 80’s Ficus were all the rage because they adapt to our harsh urban conditions. 10 years later San Franciscans found out that they rip up sidewalks. 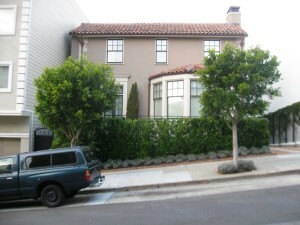 So they don’t plant them much any more, except in Pacific Heights. Your guess is as good as mine. 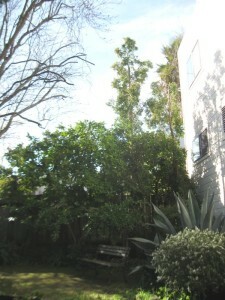 . .
Back in 1990-91 there was a freak cold spell here that wiped out thousands of Ficus trees. There are still many in the Mission, especially along 24th Street where the weather is about 10 degrees warmer than the rest of the city. The Ficus is everywhere. It is a terrible nuisance in parts of the world where the pollinator wasp has appeared. In Hawaii, Florida, Bermuda, and South and Central America it is an invasive weed. Animals and birds spread the seeds everywhere. They often grow epiphytically, starting off as a seed dropped in the crotch of another tree. They will eventually choke out the native host tree. 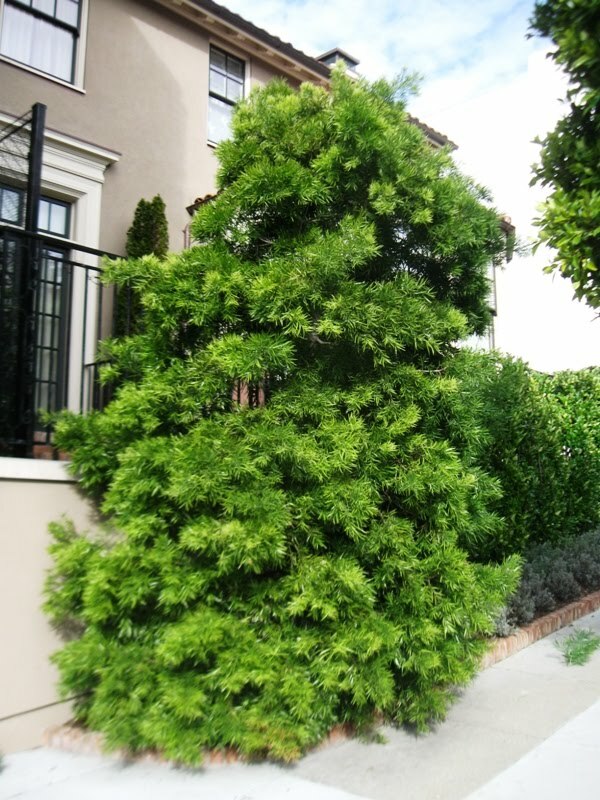 The images below are the before and after pictures of the Podocarpus gracilior. 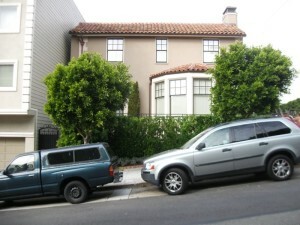 The priority was to prune the tall Eugenias away from the neighbor’s windows and make them shorter. The Laurel, meanwhile, had some dead branches and was messy. It needed some layering and some shape. Prunus, means plum. It’s the same genus as the plum, apricot, cherry, and almond. Lauro means “laurel” and cerasus means “cherry.” Which is why it is commonly called the Cherry Laurel. Often used as a hedge. Sometimes used for MURDER. 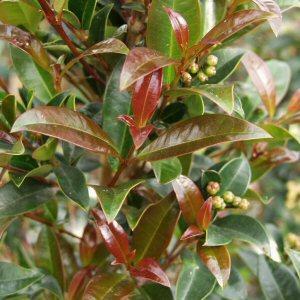 The Cherry Laurel, unlike its tasty fruiting cousins, is poisonous, though it smells like almonds. It used to be used to flavor milk. After too many accidents with children this practice ended. Me an Fetter were trimming this big puppy for about 5 hours. We are starting a yearly maintenance schedule in order to try to restore this hedge after many years of topping. It was full of stubs and suckers. It was also much wider on the top than at thr bottom and had very little inner green. Inner green is the green leaves that grow toward center of the tree. 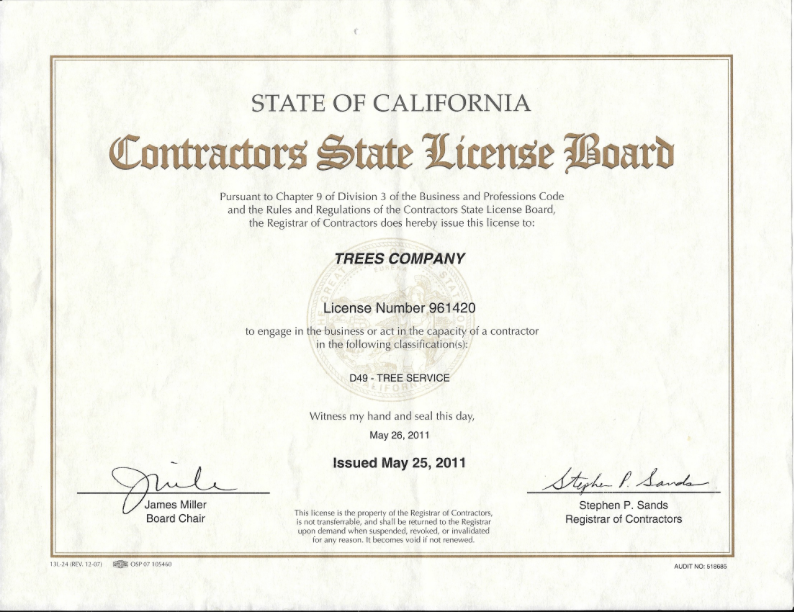 It is important for tree health. The sugars produced by these leaves have less distance to travel to feed the trunk and roots. 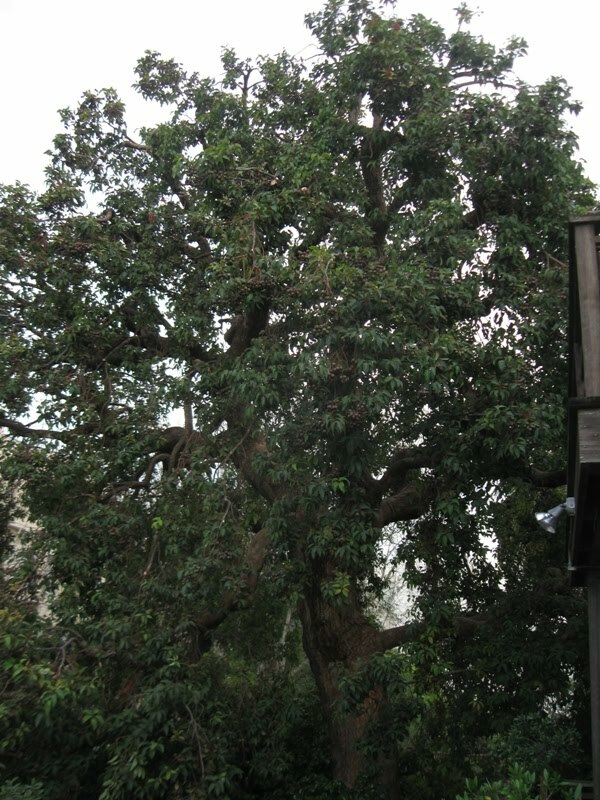 Eugenia is yet another Australian tree in Myrtaceae family (Eucalyptus, Corymbia, Lophostemon). There are three botanical names: Eugenia paniculata, Syzygium paniculatum, and Eugenia myrtifolia. I’m still trying to figure out why. If you have any idea, please comment. In 1991 the Center for Biological Control at the University of California at Berkeley went in search of a natural enemy of the Eugenia psyllid. They discovered a parasitic wasp in the genus Tamarixia in Australia where Syzygium paniculatum naturally occurs. It was initially released in the Eugenia hedges at Disneyland in July 1992. While a success story in southern California, the little wasp can’t survive San Francisco’s cooler climate. We have to rely on pesticides. People sometimes make jelly out of the pink berries. I’ve never tried it. 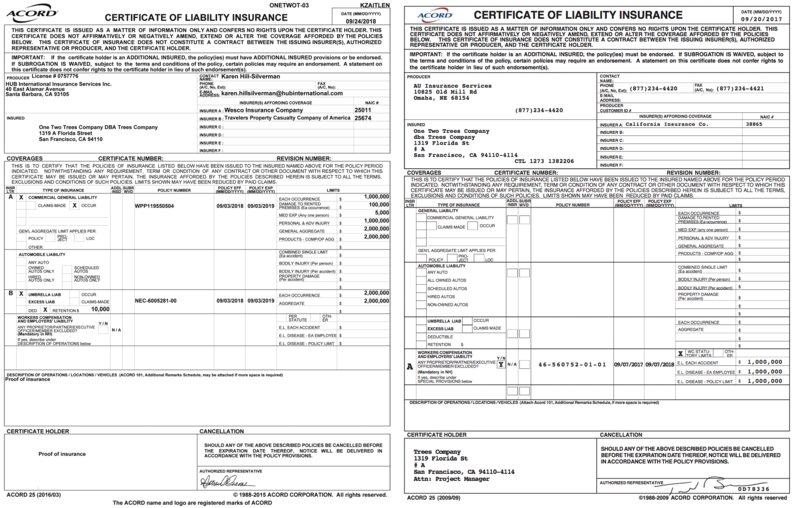 The client wanted a major reduction. This poor tree had already been abused by a hack tree trimmer. They left many large stubs which had sprouted vertically making the tree extremely dense and unnatural looking. Normally one shouldn’t remove more than one third of the canopy when trimming a tree. This tree is an exception. Our goal was to reduce the size and restore a more manageable structure. In a few years, after two more prunings, this tree will look perfect. 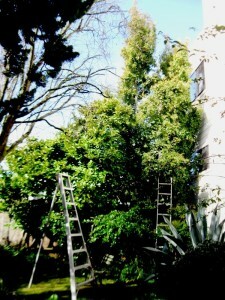 It can take several years to restore a topped tree. Lophostemon confertus is another Australian import often used as a street tree in San Francisco. 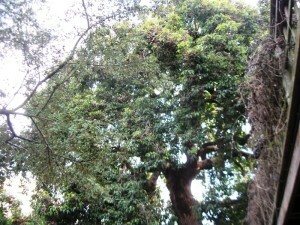 It is commonly called the Brisbane Box, also Brush Box, Queensland Box, and Vinegar Tree. I call it a Brisbane Box. 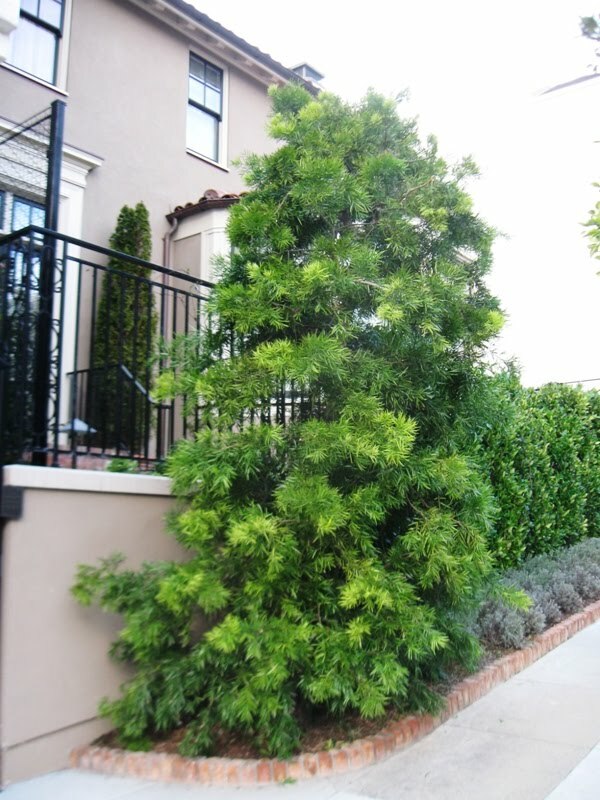 It’s in the same family as the Eucalyptus, Myrtaceae, but has a denser foliage and gives more shade. This tree isn’t very showy, but the shape can be interesting if pruned naturally. They are quite disease resistant, but don’t like constant wind. 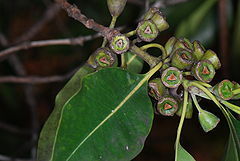 Here is a picture of its persistent fruit capsules. Persistent means that it doesn’t fall off the tree. These trees grow very tall and fast. They can grow to be 60 t0 90 feet. Unfortunately they often get planted under power lines and then get butchered, topped. A very pretty flower, but not very noticeable. Today we pruned a 50 foot tall Corymbia ficifolia. This tree, native to the far southern coast of Western Australia is in the Myrtaceae family as are Eucalyptus. Up until 1995 this tree was called a Eucalyptus ficifolia. It was one among 80 Eucalpytus to transfer to the new genus Corymbia. Corymbia…from Latin, corymbium, a “corymb” referring to floral clusters where all flowers branch from the stem at different levels but ultimately terminate at about the same level. ficifolia…with leaves resembling those of the genus Ficus. 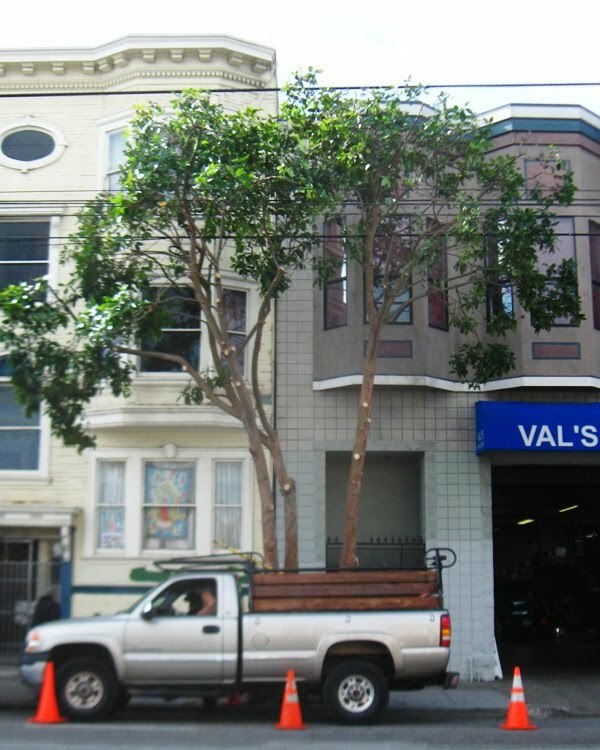 Corymbia ficifolia is a very common street tree in San Francisco. They grow very well here in sandy soil where the summers are dry. Birds and bees love them. People, one the other hand often complain about the mess from the many red flowers. I’ve seen a lot of these trees butchered. They bounce right back, however. The suckers that grow after topping often break due to their weak attachments and they heavy fruit. These heavy nuts are numerous and quite a task for the clean up crew. This particular monster is in the back yard of a very fancy San Francisco Marina Mansion. It took six of us nearly as long to set up protection, clean up the mess, and break down the protection as it did to trim the tree. We filled two trucks full of brush. It think this is a great example of natural flow pruning. 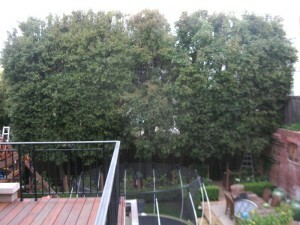 To the untrained eye one would not know the tree had been trimmed at all. Yet it has a great shape, light shines through the tree, and there is still good screening from the apartments in the background.